The latest Call of Duty title has joined the line up for GAME's inaugural event. 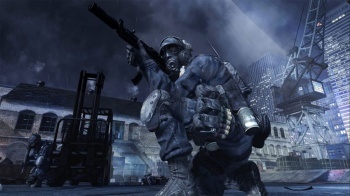 Anyone attending GAMEfest, a new videogame show organized by UK retailer GAME, will have the opportunity to play Modern Warfare 3 ahead of anyone else - or at least, anyone else in the UK. The GAMEfest show takes place in the Birmingham NEC arena from the 16th - 18th of September, nearly two months before Modern Warfare 3's release in November. GAMEfest is aimed at giving gamers the opportunity to play all sorts of eagerly anticipated titles; beside the new Call of Duty, attendees will also be able to try out Uncharted 3,as well as other big name games. Tickets to GAMEfest cost just Â£10, or just Â£5 for anyone under the age of 12. You do need to have a valid GAME reward card in order to attend however, although you can easily pick one up in store. If you aren't attending GAMEfest - or other events like Call of Duty XP - then you're going to have to wait until November 8th to play Modern Warfare 3, when it comes out for PC, PS3, and Xbox 360.